I'm still plugging along on my Grand Illusion Mystery Quilt from 2014. It doesn't seem like I'm making much progress but really I am. I worked on unit 3 blocks this week. Do I have all the unit 1 blocks made.... NO... but I needed a change. I'm about half way finished with these blocks. Less than 30 to go! As I'm working on these block units, I got to thinking.... Oh my gosh! I don't think I have a picture of what the block looks like put together. How am I going to assemble all these units in the correct placement in the block? And then that evening someone on the Quiltville Facebook group posted her block. Whew! 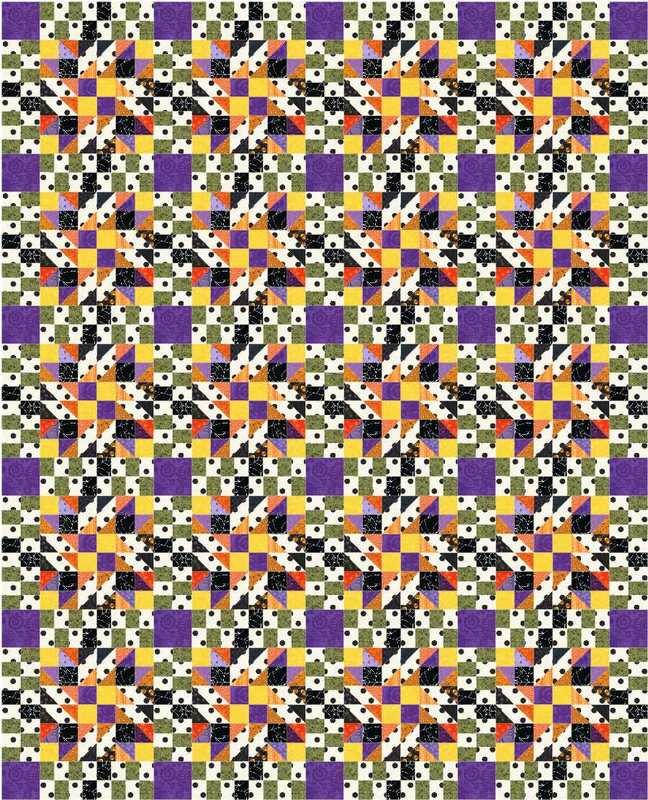 I quickly went to EQ (Electric Quilt) and drafted the block so I'd have it for reference later. This is what it looks like in EQ. Of course my Halloween fabrics are different than these but at least I have the layout and a general idea of how it will look. 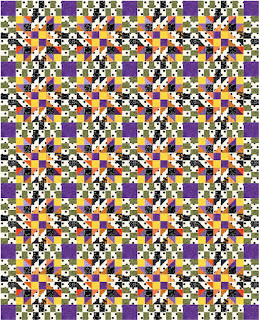 And this is what the quilt looks like (minus the borders) in EQ with the sashing blocks. It will be interesting to see if the actual quilt looks anything like the EQ sample. I don't think it will. My white background is all the same in my quilt and it's stark white with fine black cobwebs on it. I think it makes the oranges and purples pop more. I will hopefully have at least one block assembled next week for you to see. I'm anxious now and am so ready to put this together. I probably won't get to work on it much though. I only have a couple more days before I leave to go to Arizona and there will be no sewing then for a few days. Grand babies trump sewing any day. 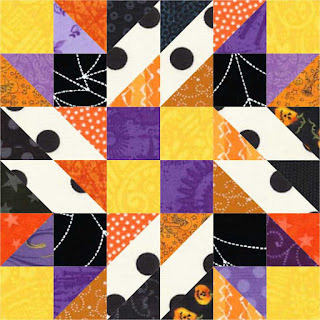 Love your idea that the quilt is of Halloween fabrics.